The recently published Q3 StartUp Health Insights Digital Health Funding Rankings report gives a good snapshot into what’s going on in healthcare startups right now. According to the report, 2016 could be end up being the biggest year for digital health funding. In Q3 alone, there were $2.4B in deals, and nearly half of those were international. The report predicts that the market will expand globally with deals taking place inside and outside of the United States. Comprised of dozens of health startups, StartUp Health tracks companies based on their sectors and specialties. The company’s report considers digital health to still be in its first generation of innovation and much action is being taken at early stages. As the second wave of digital health innovation occurs, it’s likely we will see both breakout companies and breakout deals. According to StartUp Health CEO and co-founder Steven Krein, the size of the deals in Q3 2016 were highly significant, with ten deals worth more than $100 million and four deals worth more than $400 million. The top two leading deals were healthcare and medical app Ping An Good Doctor and Onduo, a joint venture between Google’s life sciences arm and Verily, which both received $500 million in funding. 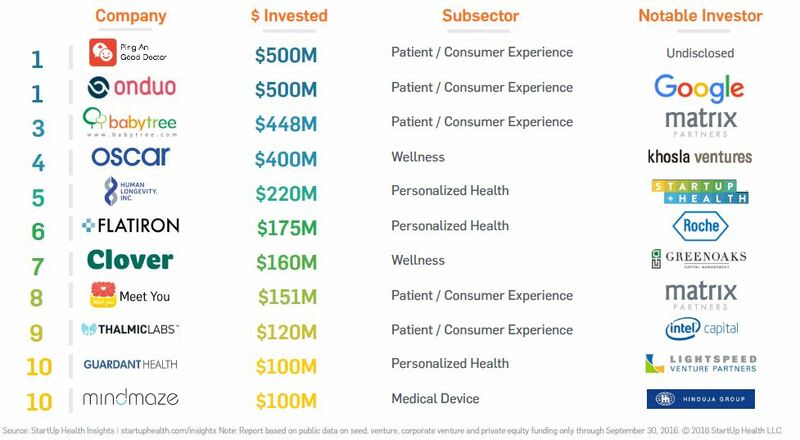 Two $500 million deals top the list and are considered the largest details in digital health funding yet. Ping An Good Doctor is a mobile app focused on bringing medical services to a larger chinese market, while Onduo is focused on solving America’s chronic disease challenges. The $2.3 billion in digital health funding in third quarter of 2016 surpasses all previous third quarters since StartUp Health began tracking digital health funding back in 2010. Additionally, 2016 third quarter investments surpassed investments in totals in all of 2010 and 2011. Rock Health,a healthcare venture fund that recently released their own digital health funding report, found that only two startups have made the IPO jump in 2016 to date. In 2015, there were six companies that underwent an IPO. This year, the two IPOs included Tabula Rasa Healthcare, a healthcare IT company and NantHealth, a biotech startup that filed for a $91 million IPO. iRhythm Technologies, a medical device company, earned $36 million in sales in 2015 from its Zio Service and heart rate-monitoring patch is expected to be the next digital health IPO. 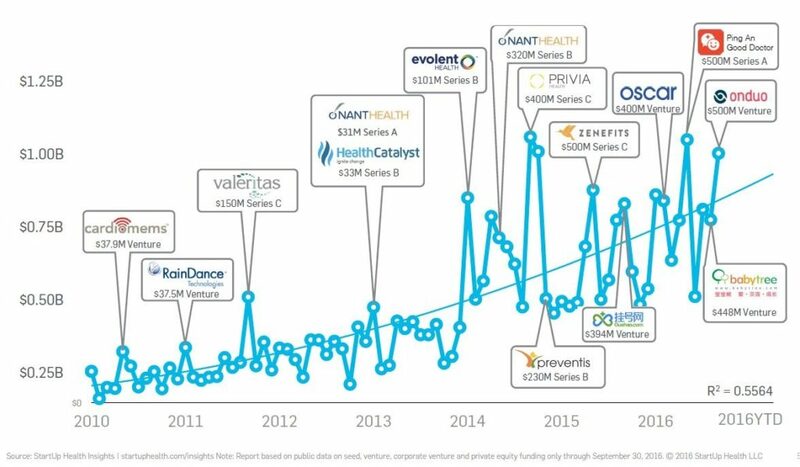 There has been a lot of fluctuation in funding month-over-month, however, StartUp Health’s report shows a steady increase in digital health funding dating back to 2010. Q3 in 2016 has provided some of the biggest deals ever and even the smallest deals of the quarter in some cases exceed the largest deals of the past, the report notes. 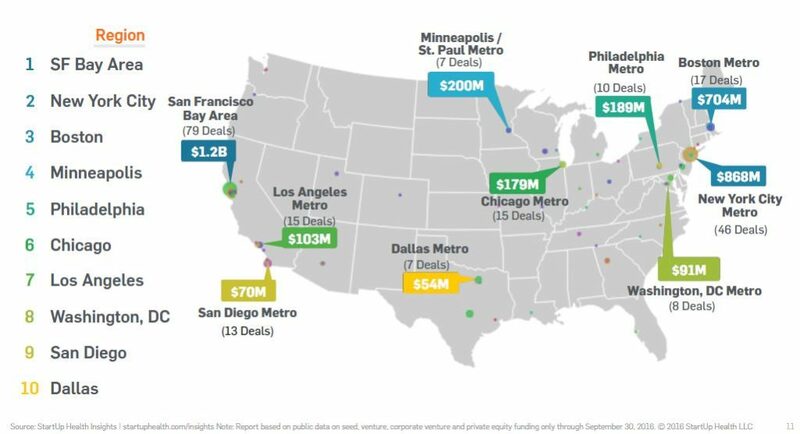 Like other sectors, deal flow and funding continues to be most significant in the San Francisco Bay Area, New York City and Boston. Combined, these regions have yielded 142 deals (36% of all deals) and approximately $2.7B in funding YTD (equating to 42% of all funding.) Below is a list of the top active metro areas from the report. With nearly half of all funding coming from San Francisco, New York City and Boston, it’s clear that these areas are still leading in digital health funding as they have traditionally. However, other cities are beginning to make a bigger splash in the digital health pond. Investors are showing increased interest in startups based in growing hubs such as Minneapolis, Philadelphia and Chicago. A growing interest among hospitals and healthcare providers to work with digital health startups and companies has aided in this growth. Many of these companies are coming together because they are all working in the same direction, so it makes sense. Digital health is still in its very early stages, with 65% of deals so far this year taking place in the seed and Series A stage. 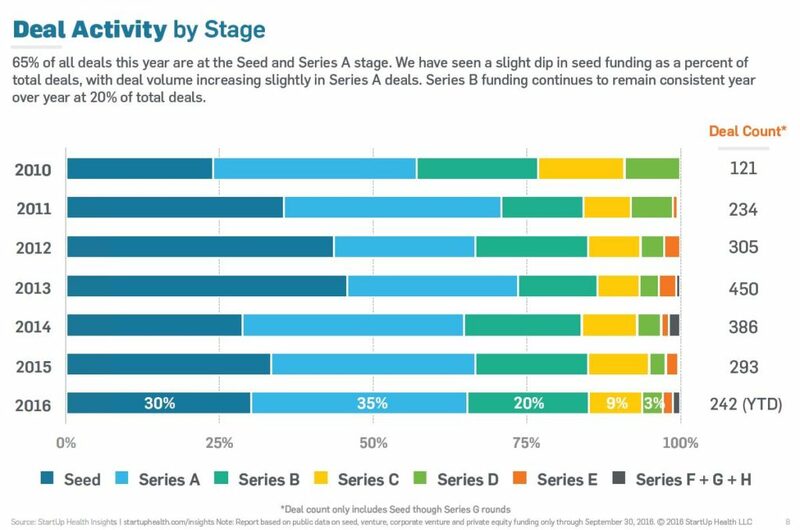 According to the report, there has been a slight dip in seed funding as a percentage of total deals, however, deal volume has increased slightly specifically in Series A deals. Series B funding has remained consistent year-over-year and comprised about 20% of total deals year to date. Given the increase in momentum we saw in 2016, 2017 is sure to shape up as the biggest year for digital health funding and startups yet. While we don’t look to technology to solve all of our biggest challenges in the healthcare industry, it’s been part of every major revolution along the way. Healthcare now stands on the cusp of an industry-wide reset, and it looks like technology could be the catalyst that starts the reaction. In 2017, it’s predicted that artificial intelligence, augmented reality, drones, telehealth and virtual reality will change how we live our lives and the way that care is provided to patients. It remains to be seen who will utilize mobile most successfully, and whether or not behavioral and mental health apps will truly make the impact that their creators hope they can. Is your Startup in need of a new Healthcare hire?